Left, piece of telegraph cable possibly used by the Compañía Telegráfica´- Telefónica del Río de la Plata joining Colonia (Urtuguay) with Argentina. Gutta percha insulated, with anti teredo tape. Center, piece of lead covered cable used for telegraphy and telephony by the Telegrafica – Telefónica company, joining Montevideo and Buenos Aires. Paper insulated and of German manufacture, missing its shield wires. 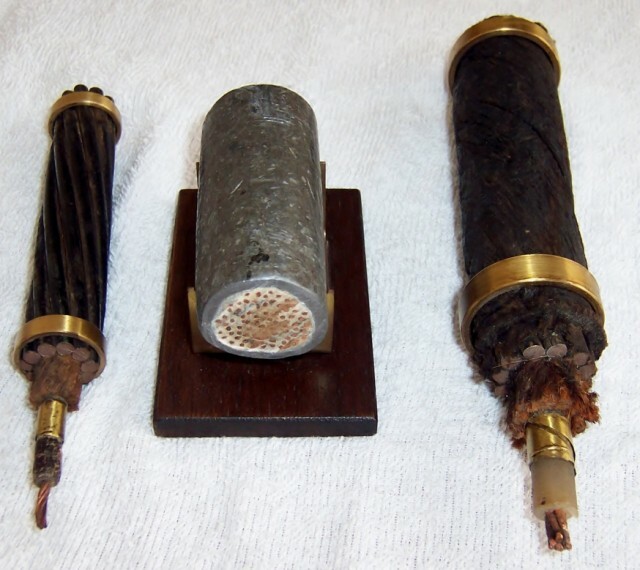 The third, unidentified, possibly a piece of one of the Montevideo – Maldonado cables of Western Telegraph.